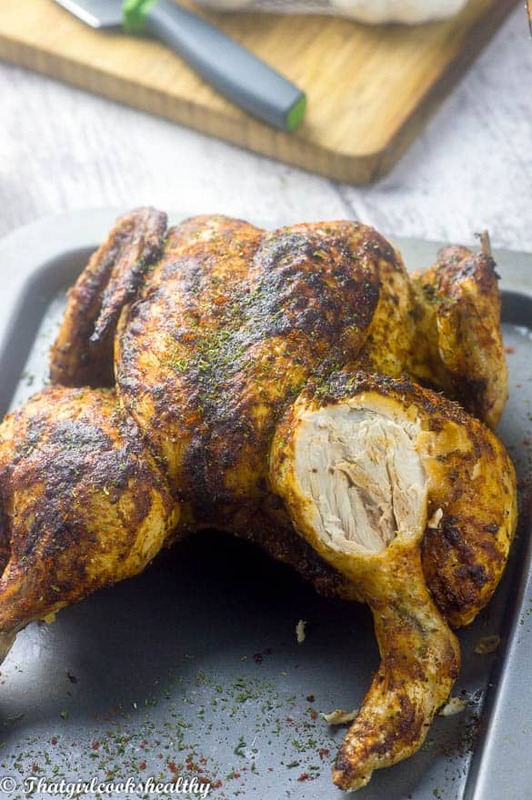 Sweet paprika roast chicken – Meals time just became increasingly fulfilled and tasty again with this butterflied generously seasoned chicken. Paprika has to be my absolute favourite spice in the world, with nutmeg and cinnamon in joint second place. I love using paprika in many of my main/savory dishes. One good example as to how fond I am of this spice would be my sweet spicy shrimp recipe which featured paprika as the star of the show. Paprika is a sweet ground spice that yields a wonderful red hue to many types of dishes. 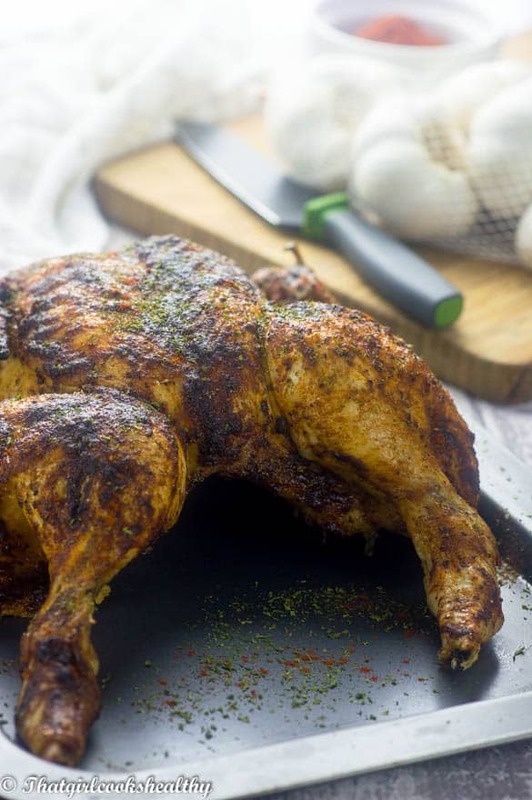 When paprika met roast chicken creating this sweet paprika roast chicken. trust me that’s when the true magic happened and my love for chicken has grown ten fold now. 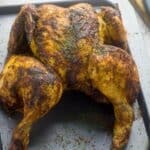 I know many inspiring cooks are intimated by cooking an entire bird, especially for special occasions which might include hosting for a large number of guests. Ultimately, I hope that my paprika sweet roast chicken will serve as a guideline for you all. My favourite go to method for cooking chicken has to be roasting or stewing. Lately I’ve been looking to up my culinary game with an alternative method that’s simple and straightforward. I believe the aforementioned can be achieved in an instant pot. I’ve seen so many chicken dinners created in this handy gadget and I’m dying to make some type of easy instant pot chicken breast because this type of recipe would come in handy for some one the go with minimal prep required. Linking back to the recipe to hand, while I don’t proclaim to be an expert, having watched the women in my family roast chicken over a course of years, almost decades I feel confident enough to share a recipe that I composed using a number of my favourite ingredients – paprika, garlic, thyme, parsley, pink salt, black pepper, agave nectar, dairy free butter and cayenne pepper. I used a relatively large bird for roasting to cook my sweet paprika roast chicken. However, to start with, if it’s your first time I would advise buying a small sized chicken until you gain enough confidence to cook a bigger bird. Keep in mind if you do use a different sized bird to the recipe, the cooking time will vary. I hate removing/fooling around the giblets which is a little bundle (usually in a small bag) containing the internal organs of the chicken. You can purchase a whole chicken with giblets removed. The supermarket that I buy mine from doesn’t contain them and that’s good news. How the paprika chicken is roasted uses the butterfly technique, where I used my kitchen scissors and cut along the length of the sternum and backbone to flatten out the chicken. Butterflying the chicken is my favourite way to roast a bird because of all aspects of the chicken cooks evenly and nothing goes to waste – you can use the carcass to create stock but that’s a recipe for another day. This recipe will do wonders for bulk cooking. Also, roasted sweet paprika roast chicken can provide leftovers for a number of days, thus saving time and effort in having to slave away in the kitchen on weeknights. Here’s a great tip, roast over the weekend and chomp on any leftovers during Monday to Friday and thank me later. Line a large oven roasting pan with some parchment paper, you may need to re-adjust the racks in the oven or possibly remove a few to accommodate the bird. Place the chicken on a food safe surface/plastic chopping board and begin to use a fork, pricking holes in the skin of the chicken. This will help the rub (wet and dry) to penetrate much deeper. Use your hands to generously season the meat with the extra salt and pepper. Don’t worry about measurements just ensure that it’s evenly spread. Turn the chicken over so that the flat side is exposed and use a pair of robust kitchen scissors and cut lenthways to remove the backbone. Once the backbone is removed, you should see a soft bone into between its legs (sternum). Use a knife to remove it. In a small bowl add the paprika, garlic, onion, salt, pepper nectar, chilli,parsley and thyme (if using fresh thyme, simply pick off the small leaves to de-stem and discard the stem) and mix. Have the melted butter to hand, but make sure it is still melted before continuing this step (very important). Pour the melted butter into the dry bowl and mix briskly with a basting brush. Using the basting brush, quickly coat the entire exterior of the chicken with the sweet paprika rub. 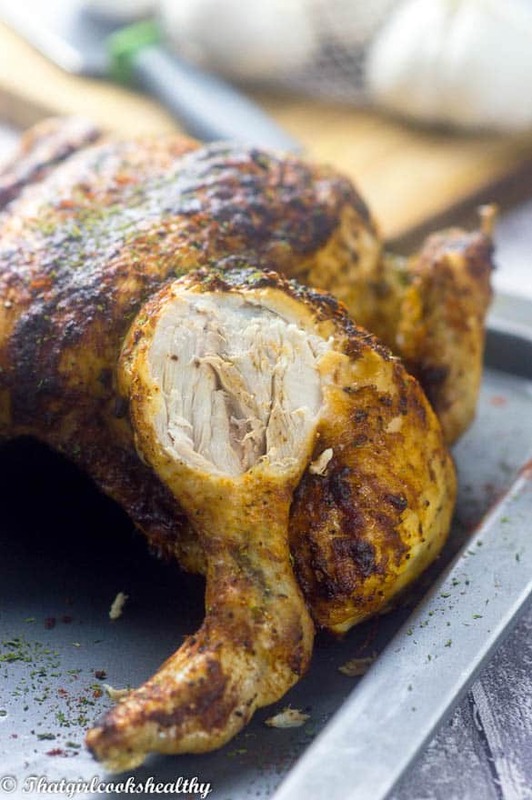 Place the chicken in the oven for 1 hr and 15 – 1 hr and 30mins. checking periodically. You can determine the readiness when the juices have run clear. Allow the chicken to cool slightly before carving and serving. That spice combo sounds fabulous, can’t wait to try it! Oh I just love paprika with chicken. You could shred this up and use it for some many different dishes. I’ve been looking for more healthy chicken recipes for the new year and this one sounds so flavorful and delicious! 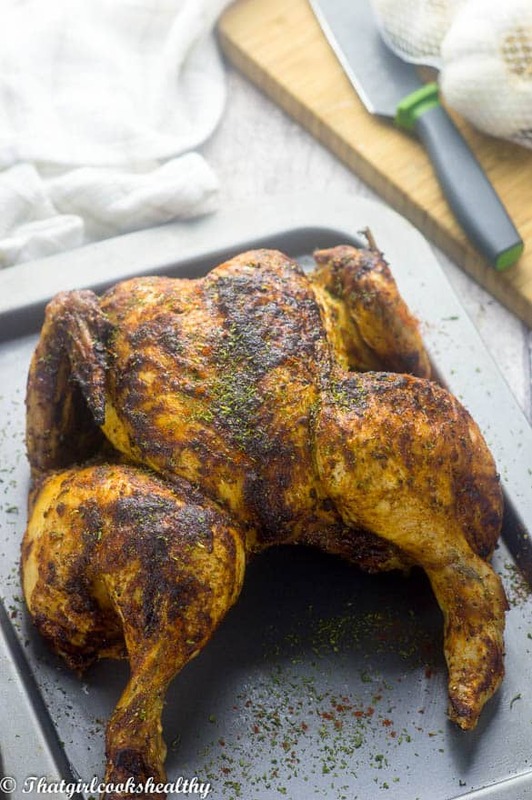 I love roasted chicken, and this one looks just so flavorful!